Away from hunting out cheap Fitbits and Apple Watches during the Prime Day deals madness, there were other things happening in the world of wearables. Now halfway through 2018, it feels as if there’s a whole lot to look forward to over the coming months. Whether it’s new smartwatches, hotly anticipated AR hardware launches and generally more new wearables to get our hands on. In this instalment of Week in wearable we delve into some of those upcoming launches, find out why one wearable tech heavyweight has been encountering some big problems on the software front and serve up some of the best reads from the site to tuck into after you’ve had your wearable tech news fix. It feels like we are increasingly dedicating more pages to talk of Samsung’s next smartwatch, which if the latest rumors are to be believed, will be unveiled at the company’s 9 August event in New York and will be available to buy on 24 August. 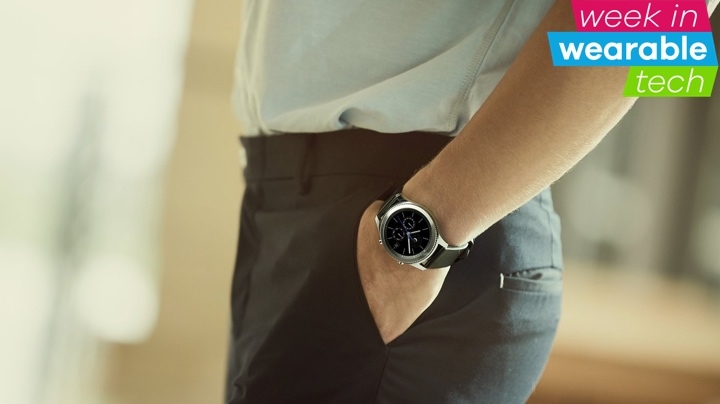 There’s been a lot back and forth over whether Samsung will ditch Tizen OS for Google’s Wear, and the latest report suggests Samsung’s in-house operating system will still be the star of the show with the Galaxy Watch (yes, a new name), tipped to run Tizen 4.0. Does that mean a Samsung Wear watch is totally dead in the water? We’d say no. There’s still one reliable leakster of all things Samsung that believes a Google OS-running watch is in the works. So maybe we’ll get multiple watches from Samsung this year? The guardians of Fitbit’s companion app have been kept busy the last few weeks. After the data and battery draining problems with its Android app, it was time for the iOS equivalent to encounter some problems. A quite sizeable thread emerged on the Fitbit Community forum where many users had noticed that their food logging wasn’t working as it should be. Food items were going missing or being replaced by other items that weren’t even in the same food group. Thankfully, Fitbit has acted swiftly to roll out an update to fix the problem. Arguably the data issues with the Android app were no doubt a more severe problem, but it may be concerning for the fitness tracker and smartwatch makers that they had a couple of big hiccups in such a short space of time. I think it’s fair to say that Wear OS has been relatively low-key during the first half of 2018 – aside from the name change, that is – but things are going to get a lot busier time in the second half. After a bunch of Fossil Wear smartwatches dropped by the FCC, the Emporio Armani Connected 2018 collection was unveiled offering some big spec boosts on the current Armani Wear watches. For starters, the new watch will of course come in a range of color finishes and for the first time adds NFC to enable Google Pay contactless payments. The new range is also getting a heart rate monitor, built-in GPS and a swim-proof design to ramp up its sports and fitness tracking credentials. The new Emporio Armani Connected 2018 is launching in September and we have a feeling it may well be joined by a few more new Wear watches with upgraded specs from the many designer brands that fall under the Fossil umbrella. You should also find out why Sophie thinks this new Armani Connected range is a big deal for fashion watches. Thanks for your visiting on this page Samsung Galaxy Watch, Fitbit’s app woes and new Armani Wear, We hope this post can be a good reference for you and provide useful information for you :-).